August 31st 2018 was a significant day to mark a new dawn for Malaysia under a new ruling government after 61 years of independence. It was also a historical day for us as we departed to Kathmandu, Nepal to start our 18-day journey to conquer Mera summit in the Himalayas. 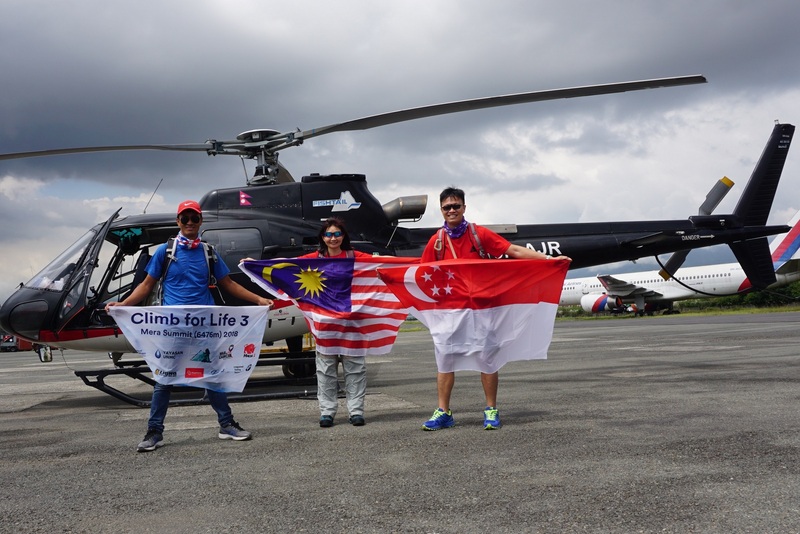 It was my 3rd #climbforlife campaign since 2013. Climb for life 3 was initiated to support the War on Cancer (championed by Dr Aini Hamid), a national campaign to boost awareness of cancer. We raised a total of RM12,500 from these companies: Mach1, Travel Cue, Integrated Tooling, Ligno Biotech, Everlantern and Numera; where the money will be used to organize cancer awareness activities targeting school children. 11 September 2018. At Mera Summit with our climbing guides. Yellow arrow pointing at Everest!! Left to right: Candy Wong, Sharon Ee, Kang Nee Ting, Sange Sherpa, Mark Mu, Angdoma Sherpa and Dendi Sherpa. The preparation for this expedition started more than a year ago but the mental planning began on 4th May 2016 whilst giving birth to my daughter! To those who have little acquaintance with the mountains please consider staying an arm length away, they are addictive. Please heed my advice! This expedition was very eventful starting from when we left Kuala Lumpur until we returned home. We missed our flight back to Kuala Lumpur due to bad weather in Lukla but we were grateful because it was only 1 day late. 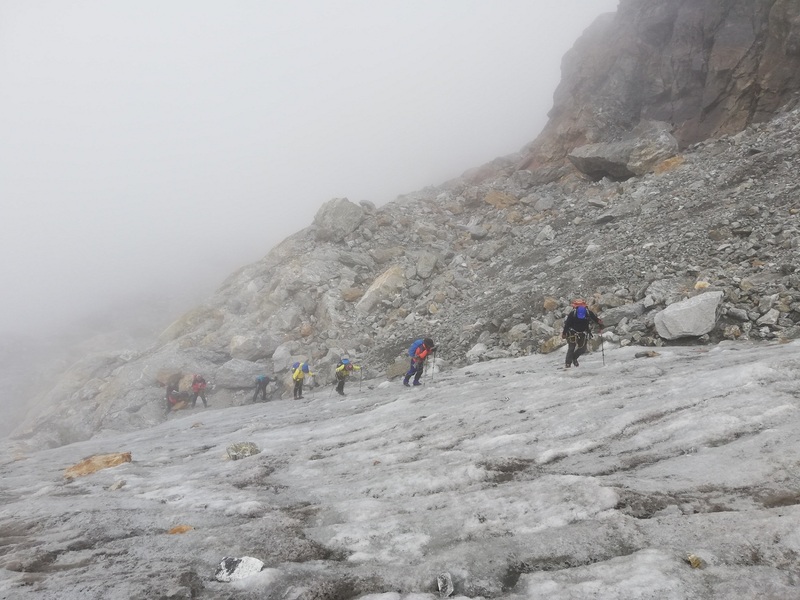 There were groups of trekkers who had been stranded in Lukla for more than 6 days before they had a chance to leave! Food in that small town was getting scarce. Clouds were so thick that even helicopters were unable to land. Our planes back to Kathmandu were cancelled and we were lucky to have a short window of sufficiently clear weather for a helicopter evacuation. We left Lukla a day later than planned in 3 different helicopters. The weather turned for the worst on the following day. If I had to choose a single word to describe this experience it would have to be “suffering”. It was nothing like a walk to ‘Everest Base Camp’ (climb for life 1) but I rate this as at least double the strenuous physical activities and level of difficulty. The adrenaline rush started even before we left for the mountains. One of my team mates, complained of chest pain and shortness of breath whilst we were practicing wall climbing at Kathmandu. I spent that afternoon in A&E of a private hospital with her trying to get a diagnosis. She was seen by 3 different doctors and tests were carried out on her over the next 7 hours in that empty hospital. Her reports made a good case study for my students. It was a misfortune that she had to cut short her trip and returned to Malaysia for further treatment as her condition did not improve overnight. The weather was unpredictable and we hardly saw much sunshine over the 18 days in Nepal. 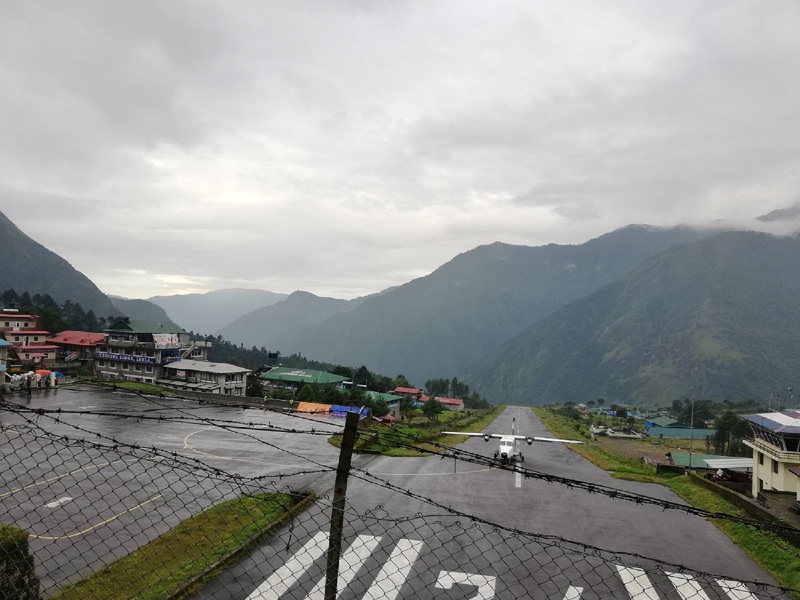 Our flights on a small 18-seater plane to Lukla were cancelled on two consecutive days due to bad weather. With no other feasible option we had to get a ride on the helicopters. The nearest place these helicopters could safely land was Surkey where we had to hike for another 2.5 hours to Lukla before we could begin our journey to Mera. Any further delay in starting our trek, would adversely affect the timeline of our trek. 3 September 2018. After 2 days of flight cancellations into Lukla we had to take a helicopter ride to the nearest possible landing pad to start our hike. At this point, we were two days behind schedule and we had to sacrifice the only two resting and acclimatization days. Left to right: Pemba Sherpa (lead climbing guide), Kang Nee Ting (Mera team leader) and Mark Mu (our Singaporean climber in the group). 4 September 2018. 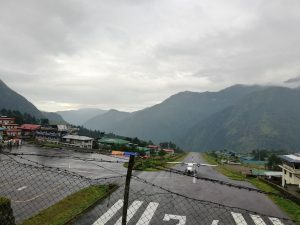 Only two planes managed to get into the infamous Lukla (Tenzing-Hillary) airport that morning. All other flights on that day were cancelled when the clouds came in. This airport has been frequently labelled as the world’s most dangerous airport. The runway is 527m × 30m with a 11.7% gradient. The airport’s elevation is 2,845m. 6 September 2018. 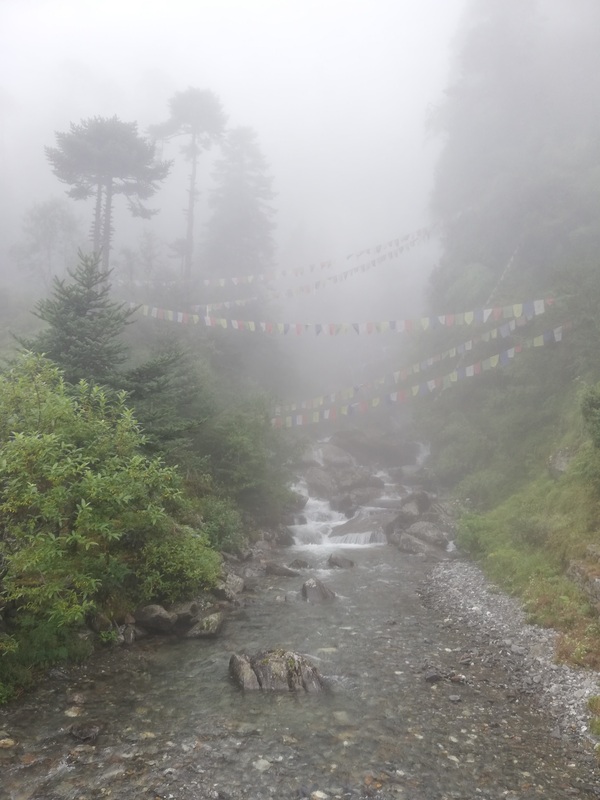 We had such bad visibility on many days whilst in the mountains. We crossed several cold icy rivers (without boots) and saw countless water walls. On average we were on our feet 8 hours every day. On the summit day, our climb started at 1am and lasted (felt like forever) for 17 hours. How we managed to walk on snow and icy glacier for that duration in the thin air (atmospheric oxygen level below 10%), I have no idea. A word to describe our state at that point is ‘zombie-fied’. We walked in the clouds and rain most days except the 12-hour window of clear sky we had during the last push to the summit. Visibility was bad on many days especially on two very crucial parts of the trail where we were literally lost in the clouds. Even a split second of not focusing on the next step, resulted in falls due to slippery rocks and paths. This led to longer routes and a longer hiking time. Inevitably, we lost our resting and recovery time. This had affected our success in conquering Mera. Eventually only four of us reached Mera South (6264m) which fell short of the intended Central Summit of 6467m. Physically it was not possible for any of us to progress further into the thin air. At this altitude (>6,200m) the atmospheric oxygen is less than 9.7% compared to 20.9% at sea level. My blood oxygen saturation had already dropped to 45% at an altitude of 5750m (Mera high camp). 8 September 2018. This is Mera Guest House at Thangnak (4350m). 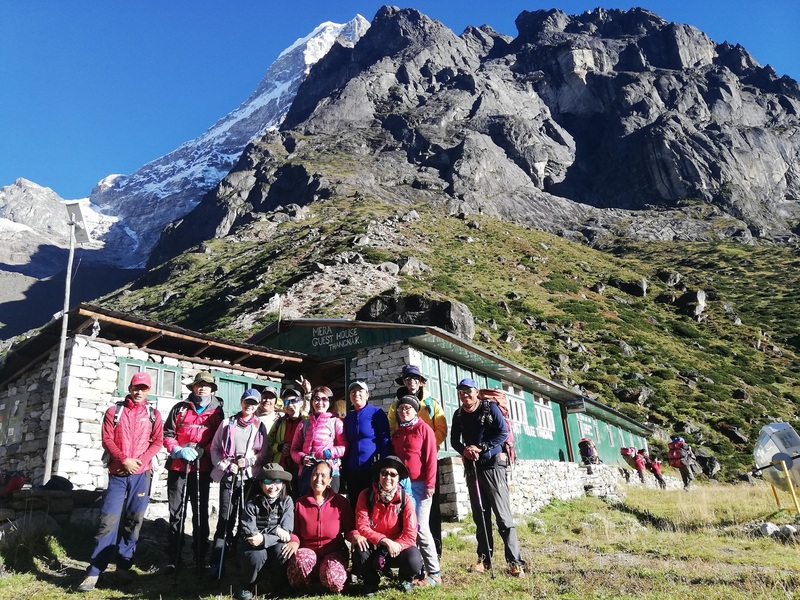 Left to right (standing): Pemba Sherpa, Mark Mu, Candy Wong, Sange Sherpa, Alisa Lim, Sharon Ee, Angdoma Sherpa, Mok Hon Yin, Dendi Sherpa; (squatting): Kang Nee Ting, guest house owner, Allison Chong. Furthest right: Our porters getting ready with their loads to start the day’s hike to Khare (4950m). We had a total of 14 days in the mountains and at least 12 days we were at an altitude of above 3,500m where the atmospheric oxygen was below 13%. The change in atmospheric pressure at altitude is also known as “hypobaric hypoxia.” Physiological adaption to high altitude leads to a higher respiration rate to increase oxygen intake. As a result, this causes a substantial loss of carbon dioxide from the blood and an imbalance of plasma pH level. The consequence of these changes increases the risk of developing acute mountain sickness (AMS) and a reduced exercise performance. Early symptoms of AMS include: headache, nausea, irritability, loss of appetite, insomnia and fatigue. One can take Diamox® to alleviate these symptoms. AMS can progress to high altitude pulmonary oedema or high altitude cerebral oedema which can be fatal. On summit day, two of us who were spared from taking Diamox® and successfully reached the peak were also taking gingko biloba supplement throughout the trek. This is just an anecdotal observation but it corroborates with a small study1 that suggested consuming gingko could be used as a prophylaxis to prevent AMS. From a personal experience, I consumed gingko during all my high altitude treks and I had manageable issues with early symptoms of AMS. Most mornings we took measurements of pulse rate, blood oxygen saturation and forced expiration from both climbers and Sherpas. 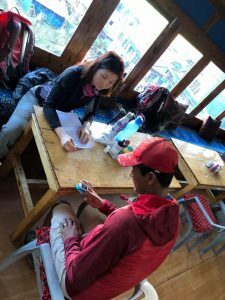 Whilst on this expedition, I took measurements of blood oxygen saturation, pulse rate and forced expiration amongst climbers and Sherpas as part of a research study. Although the data are still being analysed, the changes of these readings amongst the climbers and when compared with the Sherpas are unequivocal. 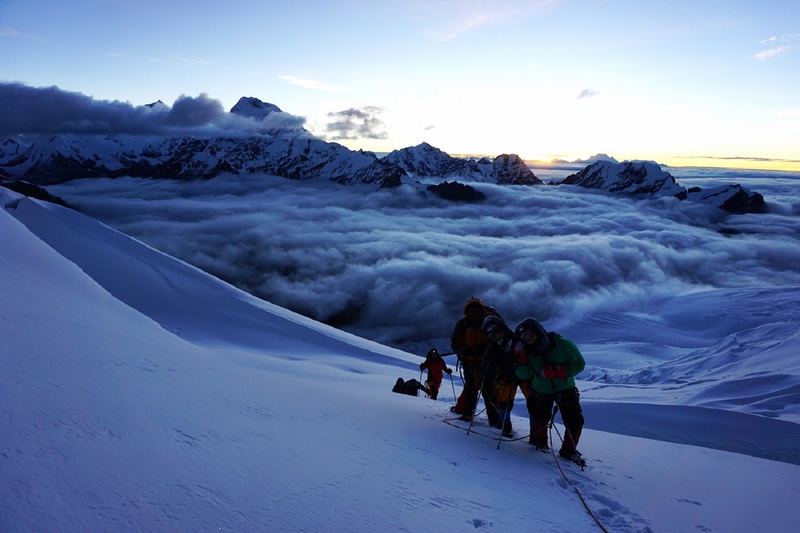 We (climbers) gasped for air at any small physical movements but this was not observed in any of the Sherpas. They are strong, agile and being in high altitude has minimal to no impact on their physical fitness. Not many fully understand the unique life of the Sherpas in the Himalayas. They fled to the Everest and valleys of Khumbu in Nepal more than 500 years ago from Eastern Tibet2. They were farmers, traders and porters. As climbing started to become popular in the Himalayas, many Sherpas started to work as porters for these expeditions because of the relatively good pay. 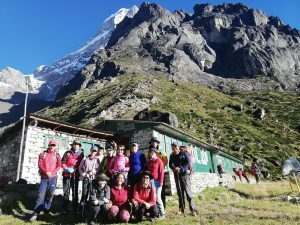 Now many Sherpas are working in this booming tourism industry and those with good spoken English are trained to be guides leading trekking and climbing expeditions. To me, they are the real heroes of the mountains and they ensure the success of each climbing expedition. I am so fortunate to have four climbing guides in this expedition who have had encounters with Everest. 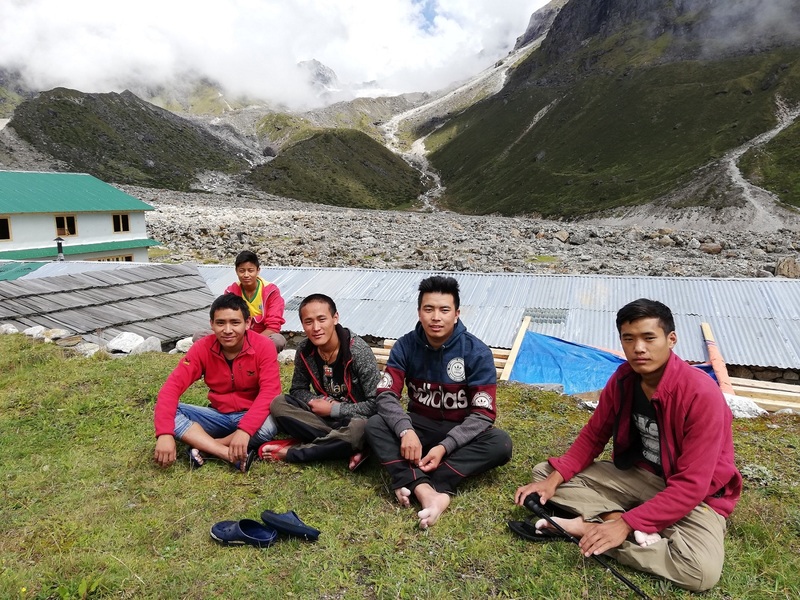 The success of this Mera climb was greatly dependent on their unwavering support and professionalism. 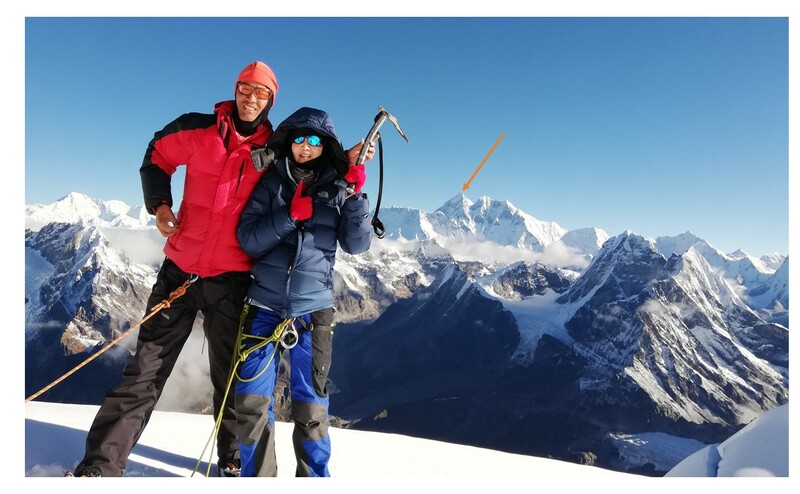 Being a lead guide in a mostly female climbing group (5 females and 2 males) must be challenging due to our different needs and demands compared to male climbers but Pemba Sherpa has been nothing short of awesome. 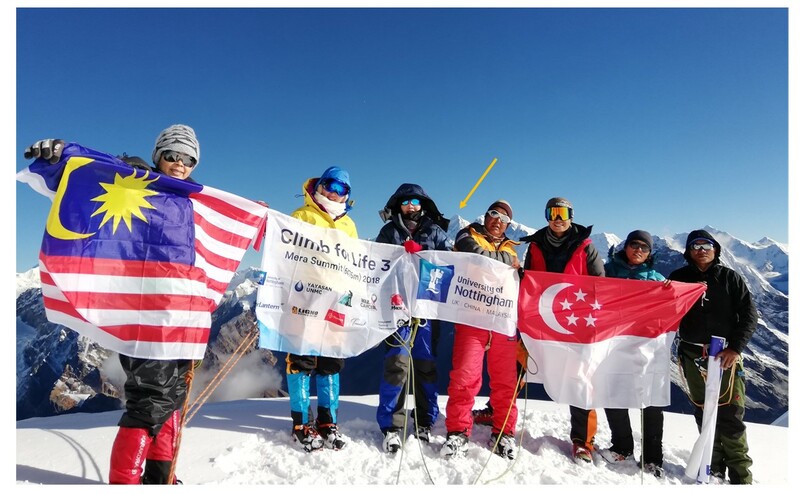 Participation of women in high altitude mountaineering activity is still low but I believe it is on the rise in the recent years. Similarly, there is now an increasing involvement of female guides in these expeditions. Angdoma Sherpa is our female assistant guide who had summited Everest. These young men (18 to 20 years old) were our porters. They are strong, polite and have a great sense of direction. Some of them have completed their college education and some are still studying English during the off season. Their aspiration is to be a trekking or climbing guide. Left to right: Pasang (sat behind), Sonam, Lakpa, Mingmar and Dorje. They are all Sherpas. 4 September 2018. There were many rivers which we had to cross. Recent and frequent rain raised the level and current of the flow. 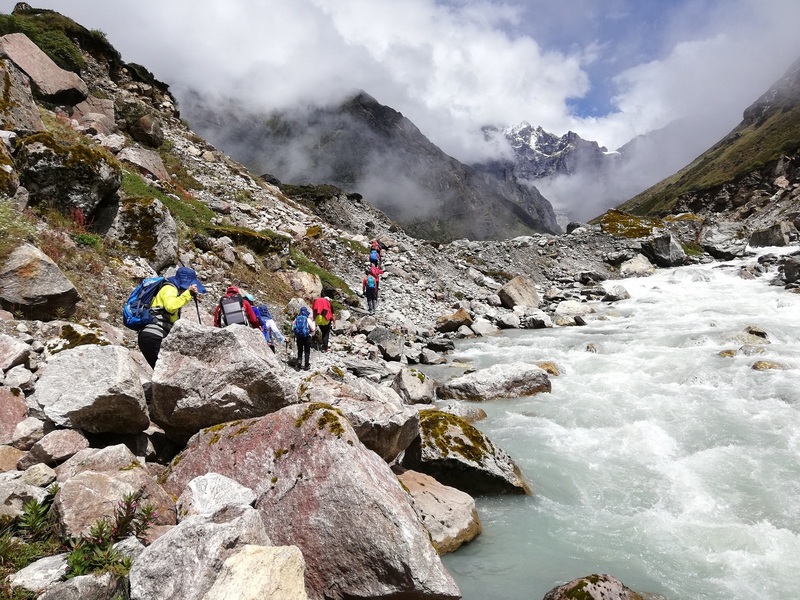 It made crossing these rivers more challenging for trekkers like us. To my surprise, our team of porters and guides, took the effort to build this simple but practical bridge to enable us to cross this rapid river the following day. What impressed me was the engineering details they included in the construction of this simple bridge. From this photo, you could see they placed patches of moss/grass on the tree trunks to reduce the slippery factor and it was being tested by our lead guide. Another guide stood in the icy cold water to remove big stones near the bridge to ensure the water flowed downstream without obstruction. Heavy rain overnight would have caused the water to rise and potentially wash the bridge away. We crossed this bridge again 10 days later on our return journey from the summit and it was still strong and sturdy. 7 September 2018. 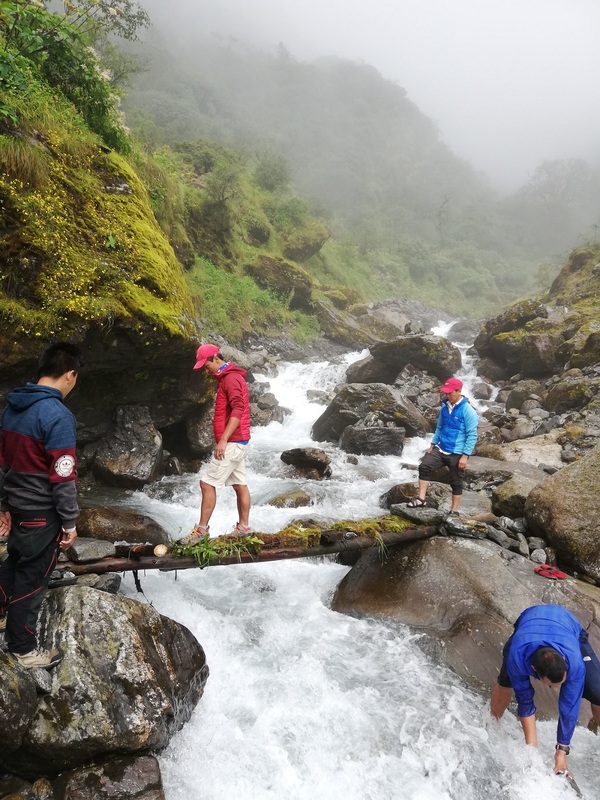 We trekked along rivers and the ridge of the Hinku Khola. Clouds gathered quickly towards late mornings and by most afternoons we were in the clouds. 10 September 2018. 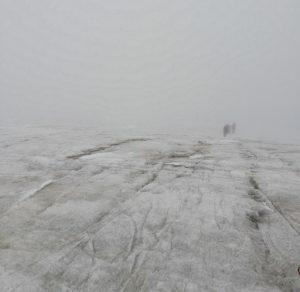 We were all roped up with crampons attached to our boots ready to walk on glaciers. 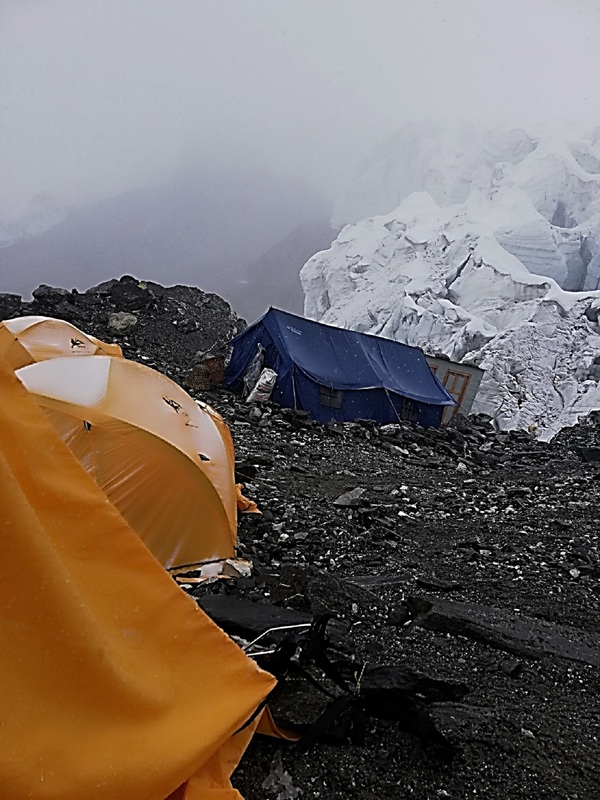 We spent the next 6 hours on the ice inching slowly towards Mera base camp (5350m) and continued to High Camp (5750m). 10 September 2018. 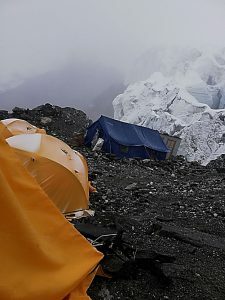 Mera High Camp at 5750m. The orange tents were our sleeping tents, the blue tent was the main kitchen and the white structure (with doors) was a newly built permanent toilet. This camp site was secluded from ice and snow thus making it an ideal place to be used as a camp site. 10 September 2018. On Mera La glacier (5350m). Visibility worsen and we took a much longer time than planned to reach Mera High Camp (5750m). “In the process of climbing, however, not only do you leave behind every material possession superfluous to actual survival, but you also shed every superfluous thought as you bend to the task of concentrating, hour after hour, day after day, on that next step up” Doug Scott, first British climbers to summit Everest in 19753. 11 September 2018. With Pemba Sherpa, our lead climbing guide on Mera summit. Orange arrow points to Everest. He has been to Everest THREE times and his 4th attempt was hampered by the 2015 devastating earthquake. The earthquake struck whilst he was at Everest camp 1 and I was getting ready to leave Kathmandu after the climb for life 2 expedition where we summited Yala (5500m). Pemba was also our climbing guide then. 1 Morage FA, Flores A, Serra J et al (2007) Wilderness Environ Med; 18 (4):251-7. 2 Tigers of the snow by Jonathan Neale. 3 Everest, Reflections from the top. Edited by Christine Gee, Garry Weare and Margaret Gee.